It was an exciting race in front of the screen. 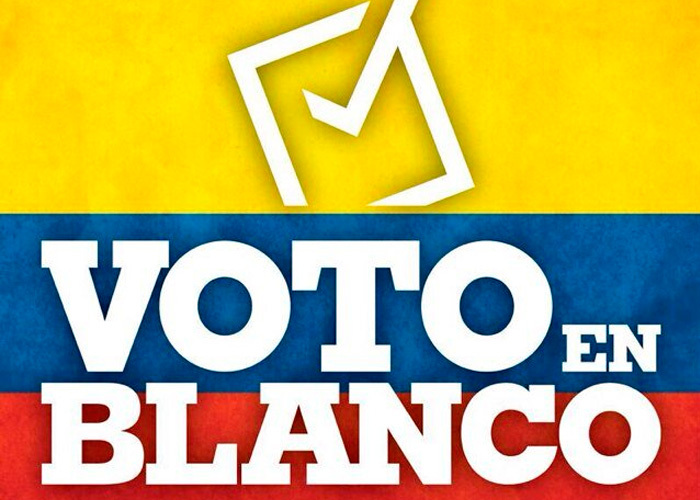 On Sunday, 32.8 million Colombians had to the chance to head to the polls to elect the lower and upper house of parliament. Colombian commentators declared ex-president Álvaro Uribe as the winner of the elections with his newly created party Centro Democrático gained 14.3% although his success might have been too little to stop the peace process with the FARC. The party of president Juan Manuel Santos, Partido de la U, lost more than half of its seats in the Senate, the upper house, but still managed to win the most seats of any party overall and most likely will continue to, thanks to alliances with other parties, have a majority in both houses. After a third of the votes had been counted for the Senate, Uribe was with 22 seats or 3% in front of Santos party with some 17 seats. However, throughout the night Centro Democrático lost seats and Santos continuously gained ground. 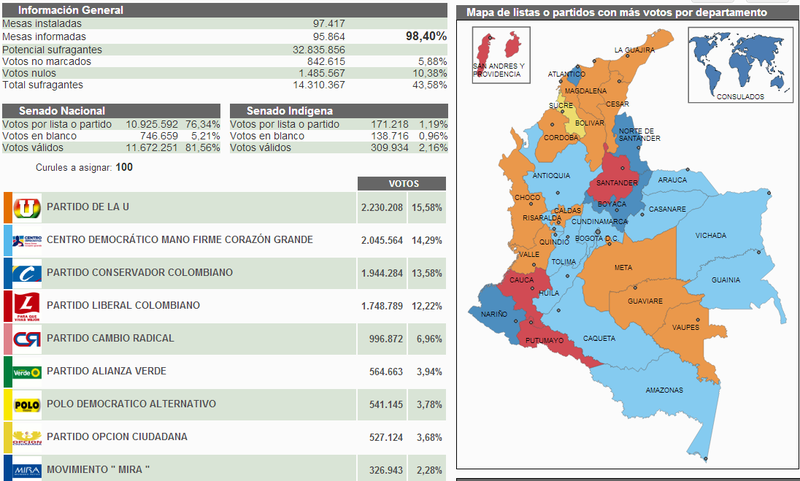 At the end, Santos’ party secured 21 seats while Uribe “only” gained 19. The Conservatives have 19 as well, while the Liberals gained 17 seats – a party that generally is in favor of Santos. The leftist parties were even worse than the last time with less than 4% each. MIRA, however, which faced scandals of homophobia did not make it into the senate. The biggest parties, however, were those 56.4% who abstained in the first place, followed by blank and invalid votes with overall some 16% of those going to the polls. Thus, more than two thirds of Colombians (63%) either did not bother to vote in the first place or are so frustrated with the existing political parties or the political system in general that they could not make up their mind to chose any party. So far, there are still no official end results posted two days after the elections – 98.4% have been counted (by 11 March 2014), but the rest remains unclear due to irregularities or has not been processed yet. Another important aspect is the gender perspective, whereby 21 women out of 100 seats were elected into the Senate, whereby ironically the Greens have with Claudia López only one woman and Centro Democrático has seven. Back in 2010, Santos and Uribe were both in the same party and Santos served as a defense minister for Uribe. However, when elected president himself, Santos changed course and placed his political future on negotiating a peace accord with the FARC. Already earlier, the two fell out when Santos restored ties with Venezuela’s late president Hugo Chavez, who had been the arch-enemy of Uribe for years. The acrimony worsened when Santos announced peace talks with the FARC, seen as a terrorist group by the United Sates and the European Union. Santos is seeking a second term in the end of May to allow him time to complete negotiations with the FARC that could end a war that has killed around 220,000, displaced some six million and transform Colombia’s political make-up if the rebels gain the political participation they seek. However, this is easier said than done because Colombians are split on the issue about the FARC. Polls suggest that about two third of Colombians supported the peace negotiations in Havana, Cuba, with the FARC; at the same time, half of the people had doubts whether the FARC guerrillas were sincerely looking to negotiate an end to the conflict. Even more revealing was the finding that some 78% of Colombians opposed the government’s plan to give FARC guerrillas the opportunity to return to political life in return for giving up the armed struggle. The result of the parliamentary elections consolidated president Santos as front-runner in the presidential vote on 25 May. His majority, if re-elected, for legislative support to implement a peace deal with the FARC will be smaller but should be big enough, if talks on Cuba succeed. According to León Valencia, director of the Fundación Paz y Reconciliación, 70 candidates who were elected on Sunday connected have been or are linked to various illegal groups in the country that are armed. The infiltration of (neo)paramilitary and organized in politics, and to a smaller degree of the guerrilla as well, has a long history in Colombia. In 2006, it became public that Colombian politics was massively infiltrated by right-wing paramilitaries who financed political campaigns of candidates friendly to them. Over Sunday’s elections, accusations of fraud and massive irregularities have been raised. Colombia’s deputy attorney general Jorge Fernando Perdomo said on Monday that some 250 suspects are investigated in connection with presumed irregularities, including vote-buying, ballot-switching and partisan officials replacing supposed non-partisan personnel in voting stations. Peace negotiations in Havana will continue on 20 March when the government and the FARC guerilla continue to seek an agreement on the issue of drugs and illicit crop cultivation. When the last round of talks closed in early March, people involved in the peace process said that the negotiation is on a good way and there are many overlapping positions. It sounded indeed promising. The new Congress will convene on 20 July to discuss critical issues for the country, including topics that have already emerged on the peace agenda in Havana, namely land reform, political inclusion of the guerilla and the third issue currently on the agenda – drugs. Congress will need to approve the regulating legislation for the constitutional reforms approved in the Legal Framework for Peace, which was passed back in July 2012, and will dictate the terms for the demobilization and reintegration of ex-guerilla into Colombian political life. Uribe will try to establish a strong opposition in Congress to undermine these issues, although it might be hard for him to find a majority. For sure, Uribe will try to do everything to gain popular support that will make it more difficult to achieve a political solution that will allow for a reintegration process of FARC ex-combatants. Afterwards a key issue will remain whether a constituent assembly, preferred by the FARC, or a referendum will take place over the peace deal that will be presented if the negotiations are successful. This should allow that the country has taken one of many obstacles to move forward. It’s Juan Manuel Santos. On the other hand, this process of peace is weak considering that FARC is not a normal revolutionary group. Here what is negotiated is not peace since in Colombia there won’t be peace for the next 20 years. The economy and culture are not robust enough to welcome previous members of armed groups (Do some research on BACRIM and you’ll know what I am talking about). The point of this negotiation is what is going to happen with the business of narcotics. FARC is not a group that fights for the rights of people. They are just a very productive business of a few people. Alvaro Uribe was not the best in many aspects as a president. However, he was the best at dealing with the FARC issue. As a I mentioned before, FARC is not just a regular revolutionary group. Therefore, conventional negotiation does not work with them (we tried before). Alvaro Uribe tried a proven and effective way to deal with them: make them weak militarily. It worked. Indeed, the first year of Santos government was successful because of this momentum exerted in Uribe’s presidency. From my perspective, Santos started the process in a premature stage (even his vice-president formula for the upcoming election agrees with this). I agree with the fact that the conflict has to end in negotiation. However, this process had to happen when FARC was weaker. Not now. However, there are clear reasons why Santos started the process so early: Re-election. His hope was that by now, he could have the “peace” secured or, in the worst case (which is happening), promise peace for his second run. Now, an immature process of peace has its consequences: the state backs off in security issues and FARC gets strong again. And this is happening. Colombia is much less safer than in 2010. Infrastructure is not as reliable. And the violence in streets is worse. My take on the issue is that Santos should not continue to be president. He is not going to do any better that what has been done. Whoever takes over must put an ultimatum to FARC and continue to weaken them…. too much writing. I hope you are having a good time in Colombia, I’ll be there soon, so let’s have a drink.